A selection of maps is attached below. The following notes concern the oldest known map of the village. 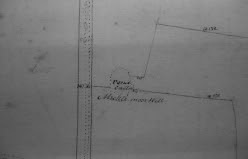 The earliest map of Wold Newton found so far is in the Yarborough estate deposit in the Lincolnshire Archives, and bears the date 1772. 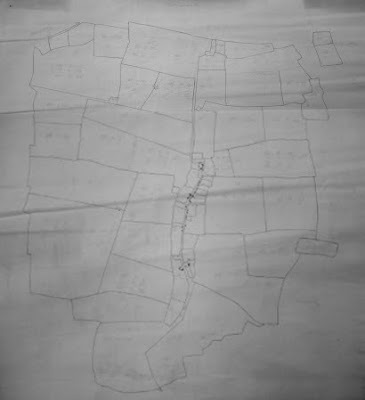 Unless there is a map in the Willoughby estate archives in Nottingham, this seems to be the first attempt at a properly surveyed map of the parish. (It's not impossible that there is a Willoughby estate map, James Milligan-Manby has one for Thorganby, part of the same estate at one time.) The Pelham family had acquired most of the estate in 1743, and completed the purchases in 1766. The Estate accounts of 1774 show just two tenants on Wold Newton, William Gilliatt and John Parsons, so the Enclosure must have been between these dates. Gilliatt pays a much larger rent. I believe this is probably the Estate's working map of the Enclosure of the parish, carried out privately, without an Act of Parliament, as by the 1770's they owned the complete parish, apart from the Glebe land. This is where the fields as we mostly know them today were laid out, and the markings on the map show measurements being used to calculate the area. I suspect, if more technical photography was used, there might be suggestions of some of the old field-names as detailed in the diocesan terriers of the seventeenth century, as some very faint pencil-marks on the map, rubbed out, are possibly those of the old names. In the fields around the village, Ostler Close and Farrow Yard are linked to families in the village around this time, Farrow's appearing in Welfitt mortgages as smallholders and also in the registers. Bunting Close is a name that does not re-appear. In Squire's (William Maurice Wright's) notes on field names, written in the first half of the twentieth century, some of the old names from the terriers (which varied a bit in themselves over the years) are located. He presumably bases his allocations on family verbal history. John Parsons (effectively one of Squire's great-great-great-grandfathers) was probably a tenant on Enclosure. He or his father were tenants of the Ashby lands of the Welfitts which Pelham also bought, and John Wright, Squire's great-grandfather, married Margaret Searle whose mother was Jane Parsons, presumably she from the registers born in 1737, daughter of John and Ann Parsons. John Parsons dies in 1793, and when buried in WN, is given in the registers as a resident of Ashby, whereas when John Wright married Margaret Searle in 1788, also in WN, she is given as a resident of this parish. 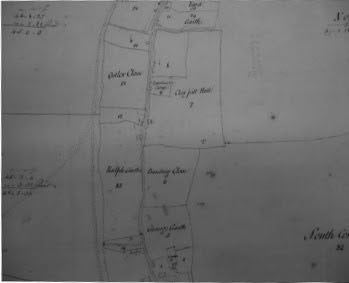 However, John Parsons has numerous infants buried in the parish, from the 1730's onwards, so I suspect he came to the Grange Farm after George Scrivener died, approx 1716, although he's never mentioned on any of the subsequent Welfitt's mortgages, the land always being described as that 'formerly held by Geo Scrivener'. 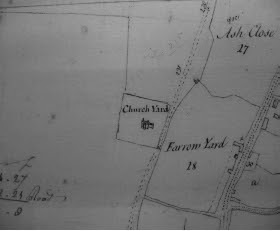 The 1772 map has numbers marked on the fields, and letters next to the cottages. So far, a matching list of names or tenants has yet to be found. Some field names were carried on, especially on what became the North Farm, such as Slatercliffe, Tranmoor, Thorganby and Swinhope Walk, from the sixteenth century terriers. Great High Close and Little High Close are probably the 'Hy Close' given in the probate of the will of 'Squire' Welfitt in 1716. A section of what we now call Petterhills Wood is called Long Moor in 1772. (I wonder if the 'Langmore' is misplaced by Squire, as it appears in no other field surveys in between.) The pond on the east side of the Ravendale road is called “Micklemoor Well”, and the Click'em lane pond nearest Petterhills is called “Side-dike”. The 1772 map also has a lot of little notations of numbers all over it, possibly to do with the surveying. It was obviously a working map, as the planting of Stock Furlong Close is recorded as taking place in 1809. It also shows a lot of the old track-ways, such as the path to Binbrook following the valley across our current Stackyard and Long Platt fields up towards Cold Harbour Farm, possibly the 'Bynbroke-gad' of the earlier terriers. What is not on the 1772 map? Any reference to Glebe land. Any reference to the Turnpike (passed 1765), eg where was the toll-gate? Unless it's the little squiggle at the SE corner of the church yard. A depiction of the burial mound in Swinhope Walk (dug out in 1828). Bob Dale's view is that it was nearly alongside the Click'em lane. Given that the accounts of it have it covering several acres, it might have been thought to be on the map. The below is a detail of the Swinhope Walk South field from the 1772 map, showing the faint pencil-marks of the measurements. The word “Orn” appears at the corner on the West side. Possibly “Urn”? I like the little gate-symbols that appear in each hedgerow. There are some other sketch maps included with the 1772 map, one of the houses and roads, showing the side lanes up to the East and West fields. 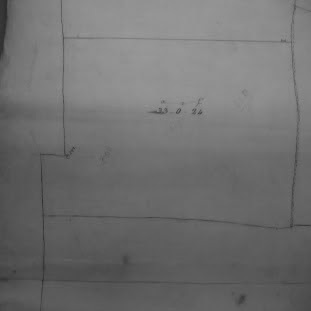 There is also a sketch-map of the fields, again with areas noted in acres, roods and perches. Other maps from a similar period, ordnance survey or similar, show lanes that don't seem to be there. An early map that does actually show the turm-pike also calls the South Farm/Grange group of buildings 'Newton Green', which doesn't occur anywhere else.